Hartz&amp; 174; Ultra Guard Plus&amp; 174; Topical Flea ; Tick Prevention For Cats ; Kittens Monthly Treatments. The use of this product kills fleas, deer ticks, flea eggs and repels mosquitoes. It has easy to use applicator. This product starts killing fleas within 15 minutes. Hartz& 174; Ultra Guard Plus& 174; Topical Flea ; Tick Prevention For Cats ; Kittens Monthly Treatments. The use of this product kills fleas, deer ticks, flea eggs and repels mosquitoes. It has easy to use applicator. This product starts killing fleas within 15 minutes. HartzÂ® Ultra Guard PlusÂ® Topical Flea & Tick Prevention For Cats & Kittens Monthly Treatments. 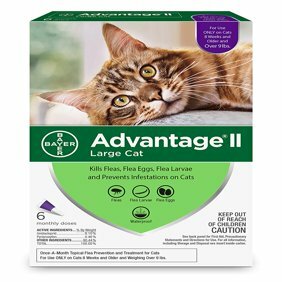 Use only on cats and kittens 5 lbs and over & 12 weeks of age and older. Contains 3 tubes, each 0.061 fl oz (1.8 ml). Net contents: 0.183 fl oz (5.4 ml). Ingredients: Active Ingredients:Etofenprox - 40.0%. (S)-Methoprene - 3.6%.Other Ingredients - 56.4%.Total - 100.0%. Instructions: Storage and disposal:Pesticide storage: keep this product in its tightly closed original container, when not in use. Store in a cool, dry (preferably locked) area that is inaccessible to children and animals.Pesticide disposal: wastes resulting from the use of this product may be disposed of on site or at an approved waste disposal facility.Container disposal: non-refillable container. Do not refill or reuse this container. If empty: offer for recycling, if available. If partly filled: call your local sold waste agency for disposal instructions. Never place unused product down any indoor or outdoor drain.Directions for use: it is a violation of federal law to use this product in a manner inconsistent with its labeling.Read entire label before use.This product contains 3 monthly dosages], each 1.8 ml. Do not apply more than once every month.Do not get this product in your cat's eyes or mouth.1. Remove one applicator tube from the package and hold in an upright position pointed away from your face. 2. Pull off cap. Turn the cap around and place on top of tube. 3. Simply press cap down to break the seal of tube. Remove cap carefully.4. Prior to application of the product, gently lift the cat's or kitten's hair coat on the back of the neck at the base of the skull, position the tip of the tube on the cat's exposed skin and squeeze out the entire contents of the tube onto the cat's skin. Do not bathe cat within the first 24 hours after spot on product has been applied.Households with more than one cat should prevent cats from grooming each other until solution has dried.5. Repeat application once every month. 1.8 ml for cats 5 lbs. and over for cats weighing 5 lbs and over. Great For My Traveling Kitty! Does this prevent against mosquitoes that may carry heartworm?